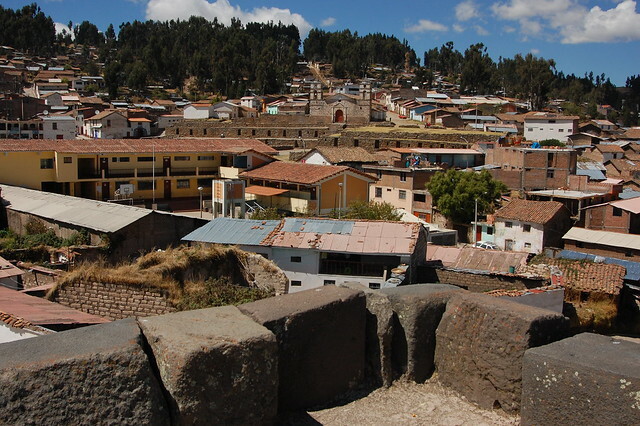 While Ayacucho is well-known for the presence of the pre-Incan Wari culture, most travelers do not realize that there is a major Incan site just a few hours from Huamanga. 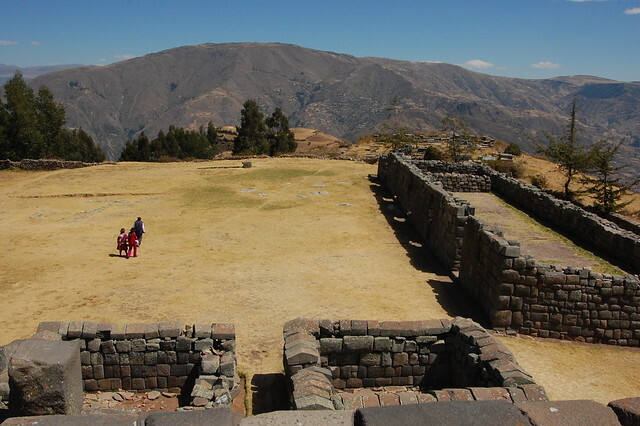 I first learned about the former Incan administrative center of Vilcashuamán from a brief mention in one of my travel guides, which said that it is an long, arduous journey on terrible roads to see these impressive ruins. 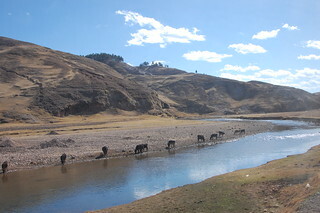 The trouble is that all of Ayacucho’s travel agencies require larger groups to make the trek out to Vilcashuamán. Outside of Semana Santa, there are not enough tourists in Ayacucho to fill these tours. After consulting with several agencies, I realized that the only way I was going to visit Vilcashuamán was if I went independently, like the locals do. As always, iPeru provided me with plenty of useful information about visiting Vilcashuamán and nearby Vischongo and assured me that the route was very safe for a solo female traveler such as myself. They were completely right. With their encouragement, I decided to experience Vilcashuamán on my own, and it was one of the best decisions of my trip because it empowered me to take local combis and buses to many other less-visited towns, villages, and ruins that are easily accessible on public transportation. 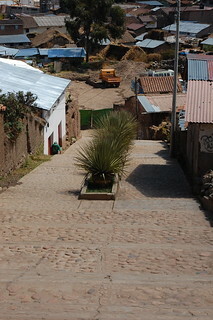 Getting to Vilcashuamán is straightforward. 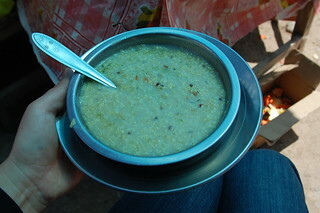 There are combis which leave early in the morning from the Paradero de Buses al Sur (the bus stop leaving for the southern region). I called a taxi at 5:30AM to take me from my hostel to the paradero, as it is still dark at this hour. As my taxi arrived to the paradero, my driver shouted “Vilcas!! !” and the drivers of colectivos (shared taxis) and the cobrador (money taker) for the waiting combi approached me. I decided to stick with the combi as it was a little cheaper (S/.15) and is usually the safer option. There were already a few passengers waiting for the bus to fill up, including a mother and daughter, so I knew this was the right decision. Around 6:30, the bus had enough passengers, and we started on the journey to Vilcashuamán. As it turned out, the roads to Vilcashuamán were not as terrible as I’d read. The route passes along the paved highway for nearly an hour, and the rest is on well-leveled gravel. I imagine that the roads may have even been paved in the past year. In any case, we arrived in Vilcas (as it is known by locals) in just three hours after a relaxing ride with some stops along the way to pick up and drop off other passengers. 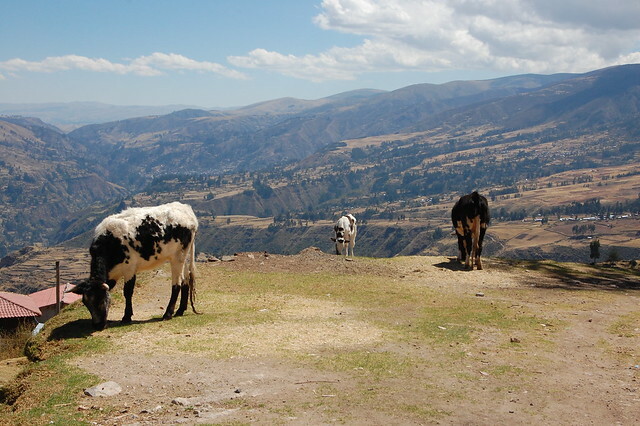 The views of the farmlands and fields around Ayacucho were lovely, as you see above. 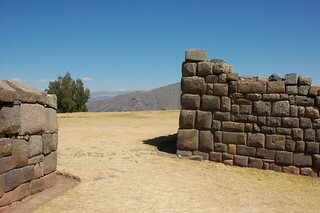 On the way to Vilcas, the combi passed by the entrance to the path that leads to Intihuatana, more Incan ruins which seem to have been a quiet retreat for the Inca due to their proximity to Lago Pomacocha and the thermal baths on site. As we approached, the cobrador and some of the passengers pointed out Intihuatana, as they know this is where many tourists go! They even offered to drop me off and pick me up on their way back through, but as I wasn’t sure how often buses pass this way, I decided to stick with my original plan. If I hadn’t been on my own, I probably would have gotten off the bus and hiked up to the ruins. Next time! 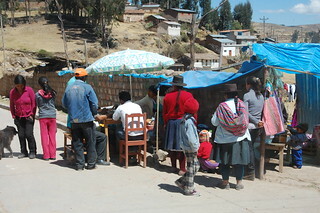 Before arriving in Vilcashuaman, the combi also stopped in the very small town of Vischongo, which is closer to Intihuatana and is sometimes used as a base by visitors. Although Vischongo does not have as many services as Vilcashuaman, the Municipio (Municipality) has a list of local hospedajes in case you need to spend the night; there is also one restaurant. As we passed through the area around Vischongo, we picked up a musician on his way to one of the other small villages located in the area, which was celebrating its fiestas during this particular week. As we drove into Vilcashuamán, I felt that it looked a lot like many of the other Peruvian towns near Lima that I’d visited over the past year, such as San Pedro de Casta. After being dropped off by the combi, I wandered a couple of blocks to the Plaza de Armas, where I was struck by what I saw in front of me: an Incan Temple of the Sun topped by a Spanish colonial church and surrounded on all sides by the town literally living on top of and within the ruins. This was the old meeting the new, the perfect embodiment of the sincretismo (or syncretism or coexistence) so evident in Peruvian culture. 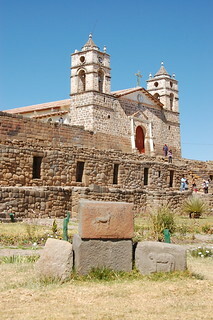 Vilcashuamán (also written as Vilcas Huamán) means “sacred falcon” in Quechua. 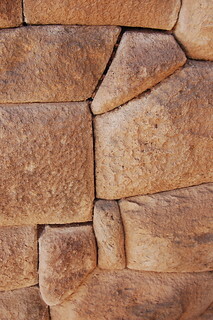 Vilcas may have been built in the shape of a falcon’s head, although the changes in the past five hundred centuries make this hard to determine. 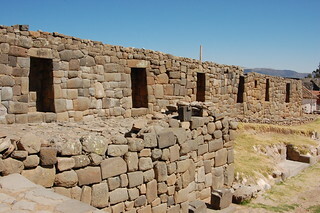 Vilcashuamán was an important Incan administrative center, as it was perfectly situated along the route between the major Incan cities near Cusco in southern Peru and the northern region. 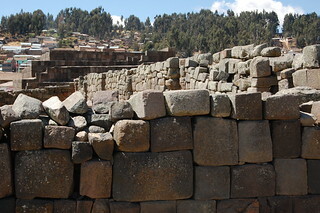 The Incas conquered this region from the Chancas and built an extensive ceremonial complex on the site, including a Templo del Sol (Temple of the Sun), Templo de la Luna (Temple of the Moon), and an ushnu, or ceremonial pyramid. The Templo del Sol was an important place of worship; the main plaza could hold over 20,000 people during important ceremonies. 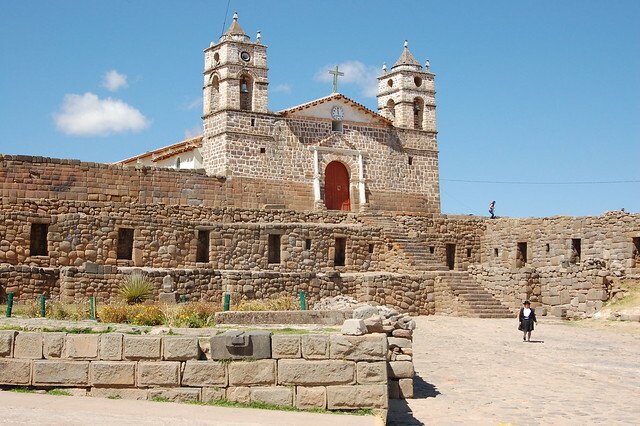 When the Spanish arrived in 1533, they destroyed much of the Templo del Sol (Temple of the Sun) and built a church on top of the Incan stonework, just as they did at Coricancha in Cusco. 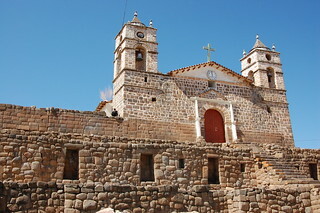 The Iglesia San Juan Bautista continues to stand on top of the ruins, reminding visitors of the tragic influence of the Spanish in this region. The Templo de la Luna appears to have been destroyed, although I read that remnants have been found below the Municipio (Municipality). 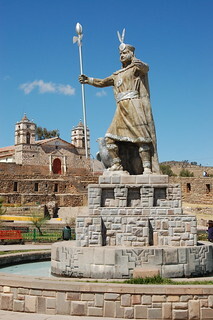 In the center of the Plaza de Armas, there is a recently constructed statue of Inca Túpac Yupanqui. 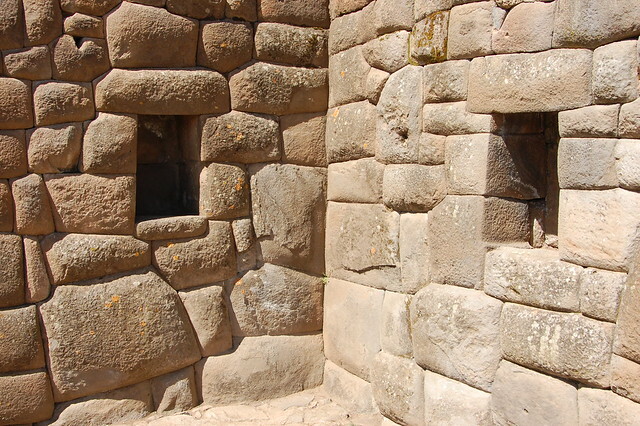 As with many Incan ruins located in small towns, you can freely wander around, admiring the masonry. 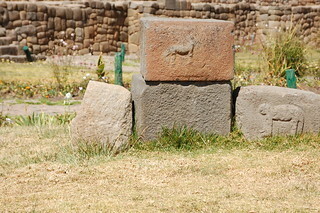 Scattered in front of the Templo del Sol are rocks bearing shapes of animals such as a llama and a monkey. 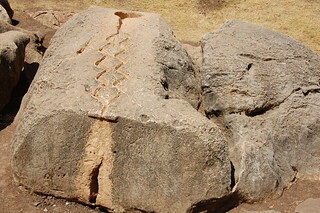 There is also a square rock with a hollow interior which is called the Piedra del Sacrificio, or the sacrifice stone, which was used during Incan religious ceremonies. There are also many ancient aqueductos, or aqueducts, which used to carry water to the living spaces of the priests who lived in Vilcashuamán. These artifacts appear to rest where they were left, surrounded by the encroaching town. After exploring the Templo del Sol and the Plaza de Armas, I wandered through the streets of Vilcas, trying to get a feel for this town. 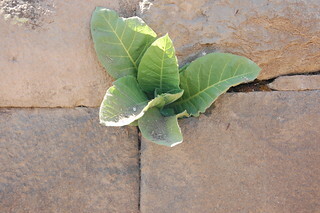 In many ways, it is just a small agricultural town built from adobe bricks. Its residents barely notice the ruins they live among, similar to my impressions on Easter Island. That said, the ruins are still a point of pride among locals! 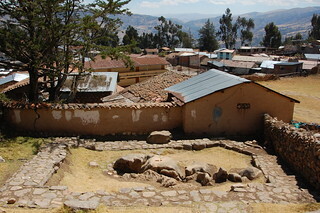 Located just a short distance from the main plaza, Vilcashuaman’s ushnu, or ceremonial pyramid, seems quite out of place among the houses that line the streets nearby. 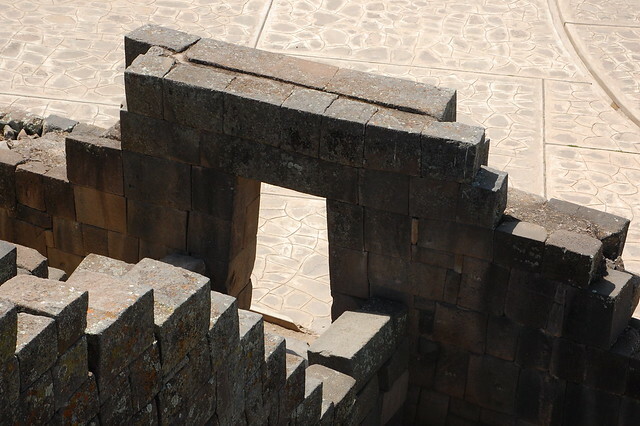 This ushnu provided the best vantage point for the Inca to watch over his people during religious and military ceremonies. 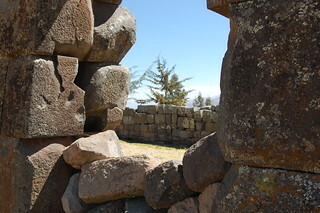 Beyond the Incan doorway to the left of the ushnu lies an open field with several stone structures nearby. 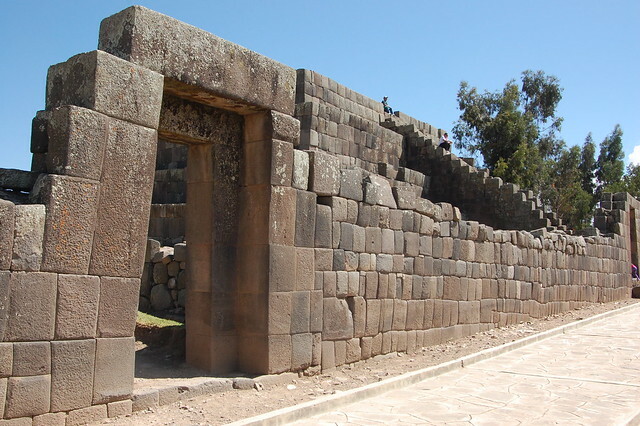 The long, rectangular structure with five trapezoidal doorways was Tupac Yupanqui’s palace, called kallanca. The above photos show two views of these ruins. 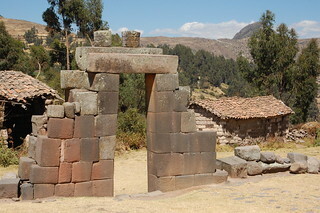 To the left of the palace lies another trapezoidal doorway leading to two covered stone structures, which may have been living quarters, or may just be more recent buildings. 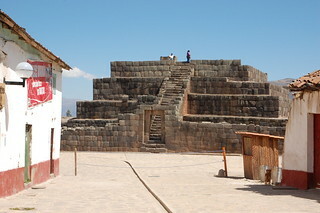 After walking around the Inca’s palace behind the ushnu, I decided to climb its stairs. Entry to the ushnu costs S/.5 for foreigners and and is well worth the price of admission. The staircase is incredibly steep and the stairs are tiny, forcing you to carefully climb sideways. 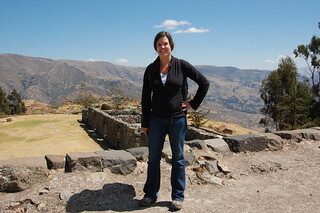 The Incas must have had smaller feet and certainly did not wear clunky hiking boots! 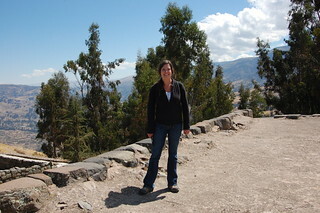 At the top of the ushnu, I started talking to a group of Peruvians when I offered to take a photo of them. As it turned out, they were a family visiting Vilcashuamán for the celebration in the nearby village, where their family was originally from; most of them had left during the years Sendero Luminoso took over the area. Some of them had lived in Lima and were familiar with Huaycán, and others had lived abroad, so they were not at all phased by a foreigner in this remote place! They were, however, very impressed that I was traveling alone. They took some nice shots of me posing in front of the various views of Vilcashuamán as seen from the ushnu, which I greatly appreciated. From the ushnu, you can see how the ruins have been absorbed by more recent constructions. While some archeologists may lament this fact, I find Vilcashuamán to be a perfect example of how the ancient and modern coexist throughout Peru. 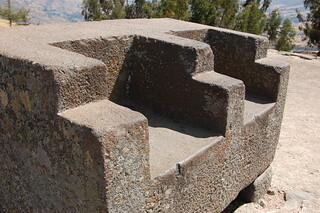 This stone is supposedly the Inca’s throne, where he sat with his wife at his side. 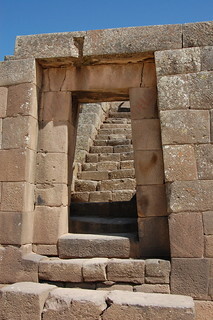 In the photo on the right, you can see another visitor sitting in the Inca’s seat, admiring the view. I was impressed by my visit to the ushnu, which has been thoroughly restored to preserve it for future generations. This is one of the best examples of an ushnu in all of Peru, and the only reason it is not visited more by tourists is that it is located in this isolated location among farming villages. 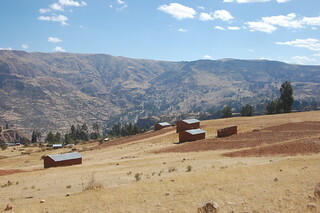 After vising the ushnu, I continued my walk through Vilcashuamán, taking in the beautiful countryside. I managed to find my way up the hill to the Piedra de Vaticinio, which some people call the sacrificial stone. According to the tourist brochure from the Municipio, this stone was used for divining the future of the Incan empire, predicting the agricultural season, and determining the future of a couple! This site has been protected by a stone wall, but as you see, it is located amidst residences, no big deal, without even a sign pointing you in the right direction. 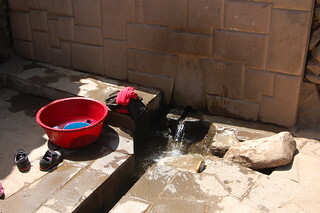 Nearby, you find the Puytuq, one of the small fountains created in the time of the Inca. Amusingly for me, someone was washing clothes in this ancient aqueduct. If this doesn’t demonstrate how the modern exists right on top of the ancient, nothing else does! I also appreciated some of the puya raimondi growing in Vilcashuamán. These plants look like they are from another world. From Vischongo, you can visit the Bosque de Puya Raymondi Titankayoq, a forest of around 400,000 of these strange-looking trees, which can grow to be up to six meters tall! At this point, it was around noon, and I had managed to visit all of the main sites of Vilcashuamán. I actually wished that I had stopped at nearby Intihuatana, as I had learned that there were many combi buses passing through the area, and there was still plenty of time in the day! Instead, I got to talking to the animated, amusing combi driver who would take me back to Huamanga, and I ended up eating at this roadside cafe with all the locals. As I was sitting there enjoying my lunch of sopa de quinoa (quinoa soup), another combi drove by, and the driver tried to convince me, “la gringa,” to come back with their group, much to my embarrassment and the amusement of the young girl serving lunch. 🙂 I also chatted with a local woman who could not imagine traveling on her own, something that seems so normal to me but so foreign to many Peruvian women. After a long wait (I *should* have gotten on that other combi! 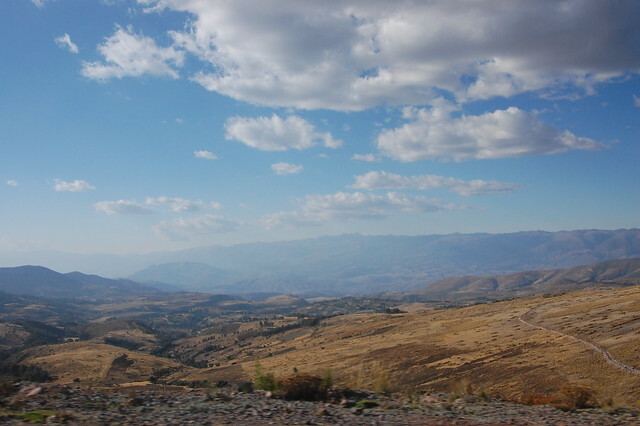 ), we started on our route back to Huamanga. This was not as direct or as quick a trip as the last one, as our driver had agreed to take a family of musicians and their goats back to the city. As I watched in surprise, they hoisted the goats onto the roof of the van, and their bleating could be heard whenever we slowed down along the route! Finally, we continued on our way, taking on more passengers until the van was pretty packed. Luckily, we stopped a few times for local snacks, which made the long ride a lot better; I bought jugo de níspero in Vischongo and my favorite choclo con queso at another rest stop along the way. All things considered, the views from the combi made the long route worth it. After all, I had developed a high tolerance to long bus rides over my year volunteering in Peru. 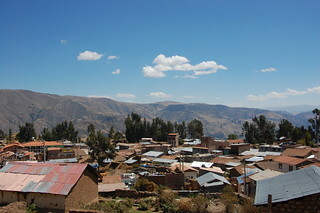 After traveling to and from Vilcas, I really understood how secure traveling with the locals was; trouble could be found in the cities of Peru, but rarely among the rural villages. I really enjoyed visiting Vilcashuamán and seeing the juxtaposition of the ancient and the modern; I was also pretty proud of myself for making it there on my own. 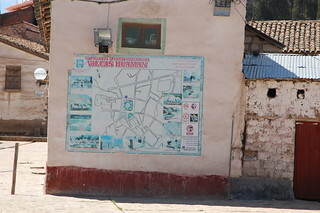 Upon arriving in Huamanga, I took a city bus to another “bus station,” or rather, an area where a number of bus companies were located next to the Grifo Ayacucho (a gas station). 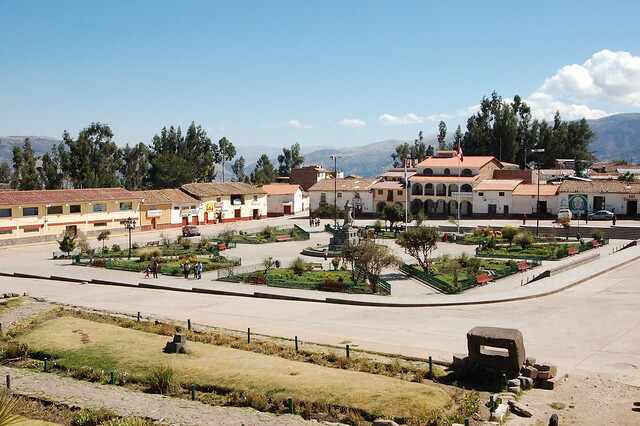 To get to Huancavelica on bus, it is safest to take an early morning combi to Rumichaca, where you can catch a direct daytime bus to Huancavelica; iPeru advised that I buy my ticket in advance. After my trip to Vilcashuamán, I knew I could trust taking another early morning combi because it would be filled with locals; in fact, I was looking forward to the experience. First of all, go! It is really easy to take public transportation to Vischongo and Vilcashuaman. Combis (van buses) leave from the Paradero al Sur (the bus station to the south) starting around 4AM. I suggest taking a taxi here as it will likely still be dark and the bus station is located outside of the center of town (a taxi should costs S/.4-6). I arrived just before 6AM as this is when the buses are likely to fill quickly; the combis only leave when all the seats are full. The ride costs S/.15 and takes about three hours. The combi will stop to pick up and drop off passengers and their loads along the way. 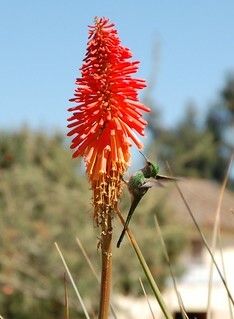 Nearby Vischongo has well-marked hiking routes to Intihuatana and the Bosque de Puya Raymondi Titankayoq. If you leave early enough, you should be able to visit Intihuatana and then catch a later bus to Vilcashuamán. 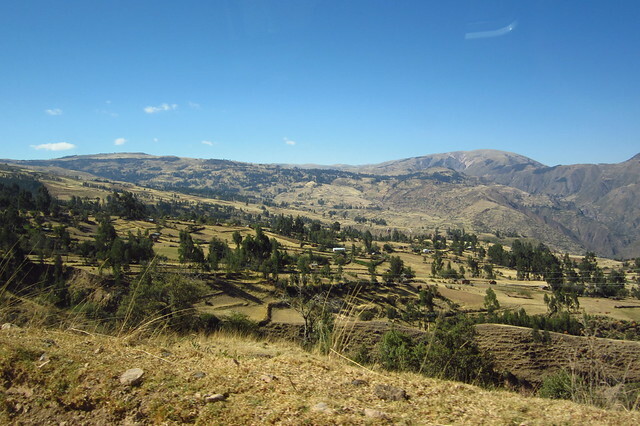 It is about a 30 minute bus ride or a 2 hour walk to Vilcashuamán from Vischongo. Keep in mind that these are rural areas and public transportation does not run on a fixed schedule. There are basic hospedajes in Vischongo; iPeru suggested I ask the Municipio (Municipality) for recommendations. 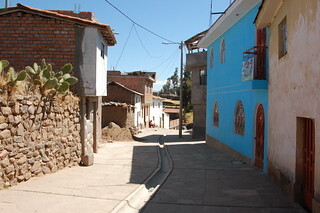 Vilcashuamán has several basic hostals and hospedajes, as most visitors stay there. Check with iPeru for an updated list of accommodations, or just ask someone in Vilcashuamán to point you in the right direction. There are at least two visible from the Plaza de Armas. That said, if you are only planning to visit Vilcashuamán, you can easily visit all of the major sites in the town in a few hours and catch a combi back in the early afternoon. The last combi leaves at 5PM; there are no buses after this time. If you read Spanish, this is an excellent summary of the history of Vilcashuamán. La Brújula del Azar has a great detailed post on Vischongo, Intihuatana, and Vilcashuamán as well as the Bosque de Puya Raymondi Titankayoq. El Comercio (a Peruvian newspaper) also has a nice video of the Inti Raymi celebration at Vilcashuamán. Finally, this site has succinct descriptions of Vilcashuamán and its surroundings. Here is a good description of Vilcashuamán in English.